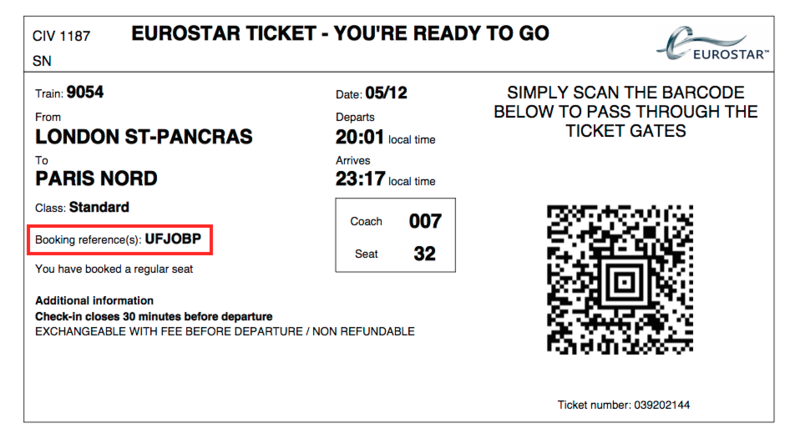 You can change your Eurostar seats for uncollected tickets or print-at-home tickets. If you have already collected your Eurostar tickets, you will need to change your seats at a Eurostar ticket office. Find your six-character collection reference or booking reference. If you have a collect-at-station ticket, your collection reference (also called a PNR) can be found in your confirmation email. If you have a print-at-home ticket, you can find your booking reference on your ticket. Go to Manage my booking on Eurostar, and enter the booking/collection reference (PNR) and surname of any passenger on the booking. Click "View Booking". You'll see your booking information. Click "change seats", and choose new seat/s from the seat map. This must be done for each passenger (active passenger is highlighted in green). Once confirmed, you can download new print-at-home tickets. If you have collect-at-station tickets, the new seat reservations will be shown on your tickets when you collect them. It is not possible to change Eurostar seats online if you've booked a Sparpreis Europa (also called London Saver) ticket issued by the German operator, Deutsche Bahn. However, if you hold a London Saver fare, you can change your seats in person with Eurostar staff at the station.